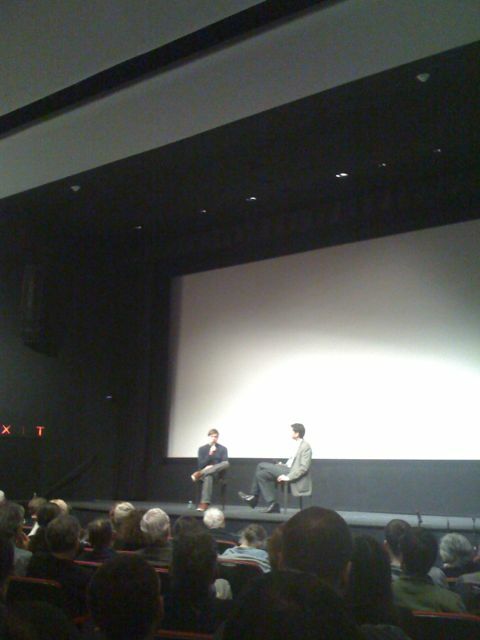 It’s hard to see it, but that, my friends, is a picture of Gus Van Sant. The Q&A was almost as teary as the film itself with testimonials: from a queer youth who thanked Van Sant for his film-making as activism and from the director of the Hetrick Martin Institute on behalf of his students at the Harvey Milk School. Lessin and Deal the directors of Trouble the Water were also in the house as well as a good crew of Bedstuy qpocs. Unpacking the film with them afterwards was one of the highlights of the night. We all agreed that it was a great Hollywood biopic. Although we loved experimental Van Sant in many of his earlier art house films, we thought that this format and budget were appropriate as a showcase for Milk’s life story. Slate Honey’s previous observation on the problematic portrayal of people of color, was indeed confirmed. However, Van Sant mentioned that many of the people depicted in the film were on set consulting during most of the filming, including the Asian man, who is referred to in the film as Lotus Blossom ( Find out where they are now). Still, I was kind of floored by Jack’s portrayal, it did feel somewhat superficial and unsympathetic. Overall though, I remain highly impressed by Van Sant’s cinematic mastery. If you squint you might be able to detect in my iPhone photo that Van Sant is suitably chill in his down to earth jeans, red sneakers and green socks. He was equally approachable and laid back after the Q & A as he happily talked one on one to folks from the audience. Thanks for putting me on the press list after all MOMA! Bloggers are tops!